If you are a regular follower of ours, you know (1) we are avid readers, and (2) we are humongous Pittacus Lore fans! 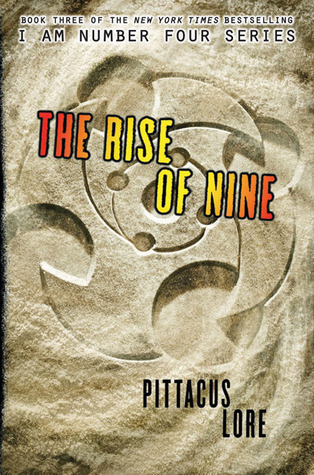 So when we got our hands on an advance copy of The Rise of Nine, which is set for release on August 21, 2012, you know we were ecstatic. But we were also worried... would it disappoint? Inevitably, in a series, there is going to be a blip, the dip that has to come, whether it be the sophomore slump, or after. Book One of the Lorien Legacies Series I Am Number Four blew us away. Our review of Book Two tells you what we thought of The Power of Six and we also were granted a rare Interview with Pittacus Lore, so check those out to see if there was a sophomore slump. But, could Book Three The Rise of Nine continue the bestselling progression? The short answer is an unqualified YES! Pittacus Lore is otherworldly in his ability to entertain with non-stop action, delicious details, and imaginable, yet creative, characters! And boy was he right in his interview with us - Setrakus Ra is back and he's badder than bad. The Rise of Nine picks up where The Power of Six left off... mass confusion and potential for destruction. But the two groups of Loriens: Six,Marina, Ella and Crayton are in Spain and Nine and Four, with Bernie Kosar, are hiding out in the US and each group tells their own stories. And, if you don't want the story to be ruined, then STOP HERE! The narration jumps around from number to number which can be a bit hard to follow, but we like how the fonts change as a visual reminder that there is a new narrator at the beginning of each chapter. As typical, there is more action than the prior books put together, and we never know what to expect next. We liked this book almost as much as I Am Number Four in the sense that it was full of unexpected surprises and new powers, especially with Number Ten Eight, who we would like to meet in person, he just seems so cool! In fact, there are so many characters, that without a great author, we would have felt lost, but this part of the series was not just about adventures and fighting, it seemed that it was more about learning who the characters are, learning a bit more about their Legacies, what is in their chests, and how they will be interacting with each other. And we were excited to learn a bit more about each of the characters so we could start to care more about some of them. We are still partial to Six, Four and Ten, and curious about the new Legacies and how everything works in the chests. Without spoiling too much... (stop now if you don't want to know who makes an appearance in the book!) Nine and Six might make a cute, tough couple. We are thrilled Sarah made a reappearance... but Sam?! And Sam's Dad? And Setrakus Ra is just one mean and nasty dude who is the bully we all hate at school. 'Nuff said without totally ruining the plot for you. Get it and devour it. Before the Mogadorians do. Decorating Notebooks: 3 killer design ideas!